The state has removed a small dock built on an island near Sebastian. SEBASTIAN – A small dock built by a Sebastian resident has people upset after it was dismantled last week, as well as tables and a BBQ that was built. A few residents built the dock over a year ago on what is called Owen Island, which is a spoil island across from Mulligans. Boaters reported the dock missing at the start of Labor Day weekend, although the pilings remain with an orange net cautioning people not to get near it. The dock is in state waters, although some argue that the island is under federal jurisdiction since the Pelican Island National Wildlife Refuge maintains it. However, the waters belong to the state, and therefore the docks have to be approved and permitted by the state. Most people argue that the small pier wasn’t causing any harm. 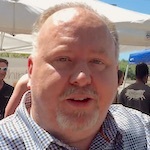 “That’s what happens when people think they can do what they want without going through the proper channels,” local resident Paul Chapline said. 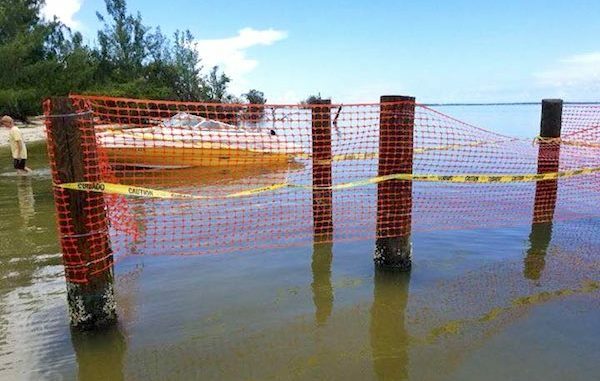 An officer with the Florida Fish and Wildlife Conservation Commission told Sebastian Daily that the orange netting left on the pilings is work he’s seen in the past by the state. “It needs to be permitted,” the FWC officer said. He also suggested that another crew with a barge will probably return to remove the pilings. Although most of this is just speculation, the FWC officer has seen this in the past in other waters. “If the state removed it because of a navigational danger, wouldn’t they also of removed the pilings,” area resident John Flagg said. Everyone we spoke with appreciated the work done for the island. The dock was maintained by Sebastian residents, most of who pick up trash on the island. “It seems odd the state would worry about that little dock when there are sunk and abandoned boats on most of the spoils,” Flagg added. Some people were blaming the City of Sebastian, but they have no jurisdiction over the island. Mayor Jim Hill was surprised to hear the dock was torn down. While we can all agree that this small dock didn’t cause any harm, especially in the way of navigation in the lagoon, the state is playing by the book with no exceptions. “Docks are permitted by the state. The reason is most docks restrict sunlight to the seagrasses. Seagrasses in our lagoon support the marine life and marine babies for our fishes,” resident Margie Kubicek said. We all appreciate the effort to give Sebastian something to enjoy in the lagoon with the dock and tables, but I guess rules are rules.